← SIDEMEN, ALAS, T’WAS ONLY A SHORT TIME AGO. Bryce was written for flutist Robert Aitken, harpists Judy Loman and Erica Goodman, John Wyre and me, percussion and marimba. It was dedicated to my son Bryce. In my opinion the best performance was given in the Glenn Gould THeatre in Toronto the night of the Glenn Gould Prize award ceremony about 6 months after Takemitsu’s death. Takemitsu’s wife Asaka and daughter Maki were in attendance as well as Bryce and many of Toronto’s music elite. The first meeting between Bryce and Takemitsu and the subsequent composing of Bryce, is documented in an earlier article on this site titled Toru Takemitsu. I was prompted to write this article after a recent performance of Bryce in Toronto by five young women, all of whom were connected to people I’ve known for years. Flutist Sarah Moon, harpists Sophie Baird-Daniel and Angelica Hairston and marimbist Chung Ling-Lo. The percussion was played by Allison Bent, a former student in my university percussion ensemble. Allison asked me to attend one of their rehearsals. This would be my first time hearing Bryce played by people other than those for whom it was written. All the performances in my past had been, with one exception, with the original ensemble. At the rehearsal, it was clear the work had been prepared with great care and sensitivity. 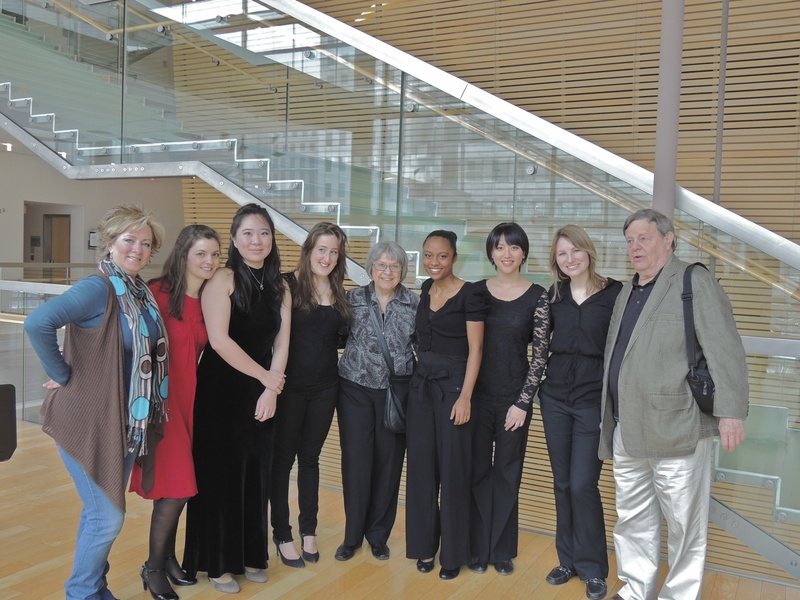 The 12:00 noon, 22 January, 2013 concert was given in the Canadian Opera Company, Richard Bradshaw Amphitheatre. Over the years, I have grown to enjoy this space. It’s an open venue, two floors above the opera lobby, with raked bench seating, huge wall to wall windows rising three stories with an expansive view of University Avenue, its lanes separated in summer by colourful flower gardens now covered in still pristine snow. The Bradshaw, as I think of it, has a surprisingly good acoustic. The amphitheatre is named in honour of the man who, besides conducting the orchestra and managing the opera company, worked tirelessly for years to bring a new opera house to Toronto. Not long after achieving his dream, Richard dropped dead next to an airport carousel waiting with his wife for their baggage. The one hour Bradshaw Amphitheatre concerts are free to the public. The programme was titled Meditations on East and West and began with Takemitsu’s Air for solo flute, his last composition, completed in 1994 in his hospital room. He died a few months later. Air is not only beautiful, it is challenging in its simplicity. Sarah Moon, a student of Toronto’s emminent flutist Susan Hoeppner, played the work with elegance and a lack of affectation. She would once again delight the audience with her performance of the extremely demanding flute part to Bryce. The programme’s second work was titled Histoire du Tango (1956) by Astor Piazzolla, a three movement work elegantly played by violinist Rebecca MacLeod amd Sophie Baird-Daniel, one of the harpist’s in Bryce. Bryce ended the concert. 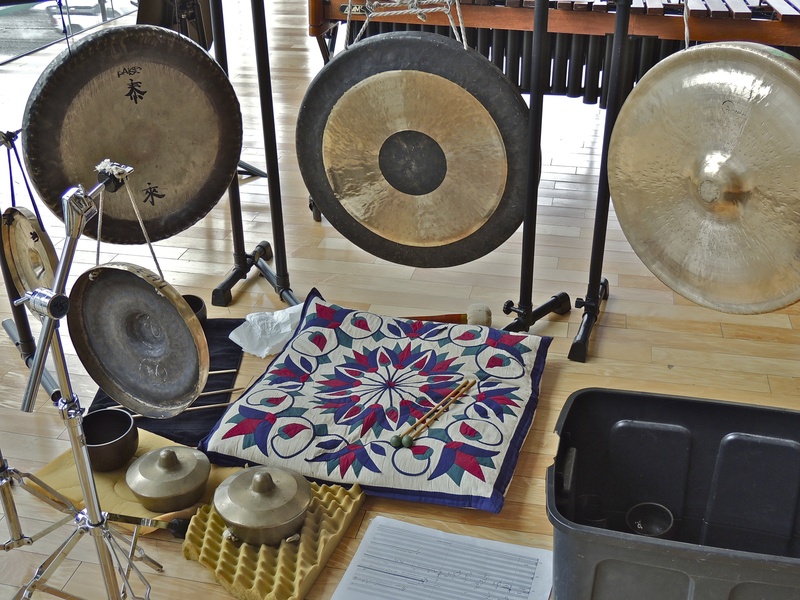 The flutist and harpist mentioned above were joined by another harpist, Angelica Hairston and marimbist Chung Ling Lo and percussionist Allison Bent playing gongs and smaller ringing sounds some floating on water. My wife Eleanor and I were seated together. The great harpistt, teacher and friend Judy Loman and Susan Hoeppner arrived and sat with us. The flute part requires multiphonics and other extended techniques. The harp parts are perfectly written, a fact noted by Judy Loman who once said, “Toru must have studied with a harpist”. Judy was one of the people for whom the work was written. We had not seen each other for many years and it was a pleasure sharing a warm reunion with her. L. to R. Susan Hoeppner, Rebbeca MacLeod. Susan Moon, Sophie Baird-Daniel, Judy Loman, Angela Hairston,Chung Ling Lo, Allison Bent, R. E.